Sphero is a sturdy, buoyant, waterproof, hard shelled ball that changes color and responds to commands via a handheld device – a smartphone or a tablet. At the most basic, Sphero can be used as a game controller for a number of downloaded games. But there are more complex functions that teach programming as well. It’s very sturdy and waterproof which makes me much more comfortable about handing it to a rambunctious teen or extremely eager toddler. There’s the Sphero itself, an inductive charging base and plug, holder, and best of all — two ramps with rubberized feet. Pencil here for scale. Sphero 2.0 retails for $129.99. The original Sphero is available for $79.99. Either can be purchased at a discount in an educator 10 pack. Game play and the pre-coding apps are friendly with kids as young as Kindergarten but Sphero is fun and useful for pretty much any age. Sphero can be used just like you’d use any other gaming platform at the library. It’s really so much fun to play with. But for someone who wants to dig deeper into the technology angle with a more active approach, I like the way Sphero allows for scaffolding skills. Begin by showing users the basic Sphero app. 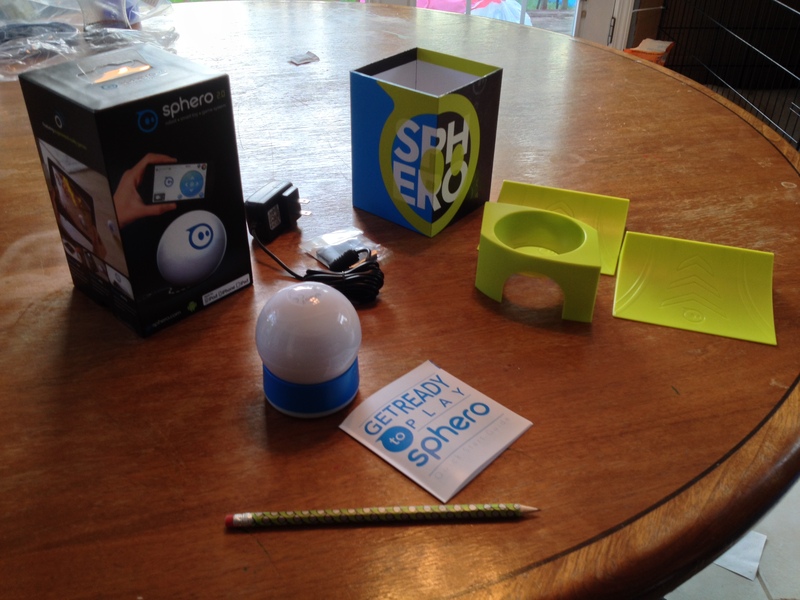 This introduces the capabilities of Sphero, couched within an origin story and a fun game. Then it’s easy to move on to apps that allow users to code without knowing they’re coding. Something like Sphero Draw ‘n Drive has users draw pictures on their handheld device, and then Sphero will act out the drawing that was created, changing direction, speed, and color just like the artist did while drawing. Beyond that, you can move to Sphero MacroDraw or MacroLab which give allow you to add different action components together to build programs, then give you real-time feedback on the macros that you program. Sphero needs some time to charge, then you’ll need to download the apps you intend to use, and get your bluetooth connection up and running. Plan at least an hour of playing around with it before you introduce it to kids so you’re comfortable with the basic controls. Plenty here to expand into a recurring program. Once your kids have mastered the basics, there are lots of educational projects you can embark on, and another app, orBasic for Sphero, that delves deeper into the coding element. You could also use this in a more hands-on Maker program by creating mazes, obstacle courses, and challenge courses for Sphero to compete in. You need to be able to connect a device to the bluetooth on your handheld device. A bluetooth enabled tablet, smartphone, or iPod for each Sphero. It is SO MUCH FUN. The fun is really a huge draw for getting users to engage with it. And it’s SO EASY to begin. There are no necessary skills, beyond basic hand-eye coordination, to start having fun with it. If you’re going to jump in an purchase an Educator pack, I think that would be a good, long-lasting value. The Bluetooth connection on my Android device was pretty fussy. It was much smoother when used with Apple products. I don’t know if this is a function of the Sphero or of my Xoom, but it happened. It’s a pricier prospect. It works best as a one device per person project, but you could fairly easily construct your event so that two people share one Sphero. But beyond that, each Sphero must have a dedicated handheld device to control it. If your library already has iPads, you’re set. If your community has a 1:1 tablet program in schools, that should work too. Otherwise, this may be a significant limiter. I really like this device and think that there are lots of opportunities for fun, education, and expansion. Have a ball! –But proceed with caution (solely due to the cost and additional tablet constraints).